It was a couple of phone calls on the morning of the boys state soccer championship match that sums up the remarkable Baldwin High School career of Angelo Deloso-Flocco. 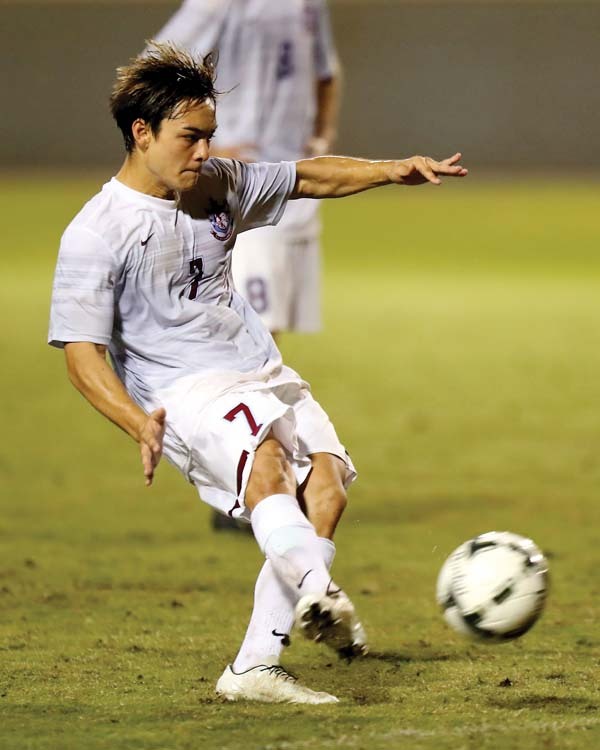 Deloso-Flocco recently wrapped up one of the most impressive boys soccer careers in Maui Interscholastic League history, leading the Bears to a co-state title after lightning forced the stoppage of the championship match against Hawaii Prep 4 1/2 minutes into overtime. He is the overwhelming choice of the league’s coaches as The Maui News MIL Player of the Year, an award he shared with teammate Dante Perez-Martin last year. After guiding the Bears to the first state soccer title ever for an MIL boys team, Deloso-Flocco recently gave his verbal commitment to the University of Nevada-Las Vegas to continue his career. “A perfect way to end up my high school season and my high school career and life in Hawaii,” he said. 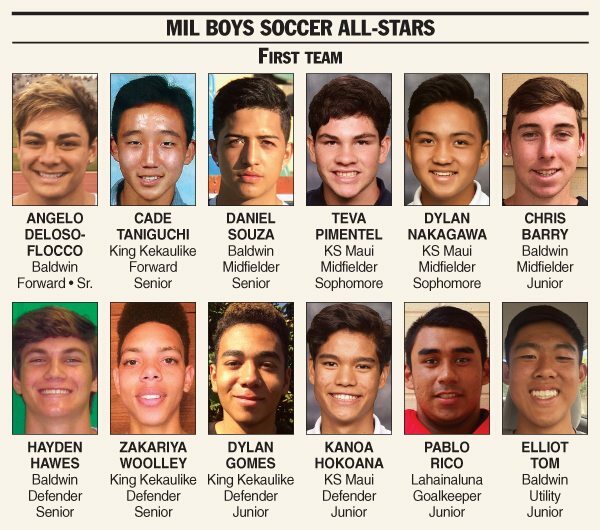 Deloso-Flocco, a senior forward who scored 16 goals this season and 57 in his three-year Baldwin career, is joined on the MIL first team by teammates Daniel Souza (midfielder), Chris Barry (midfielder), Hayden Hawes (defender) and Elliot Tom (utility); King Kekaulike’s Cade Taniguchi (forward), Zakariya Woolley (defender) and Dylan Gomes (defender); Kamehameha Maui’s Teva Pimentel (midfielder), Dylan Nakagawa (midfielder) and Kanoa Hokoana (defender); and Lahainaluna’s Pablo Rico (goalkeeper). Blake Nunes, the Baldwin school record-holder for goals in a season with 26 before playing collegiately at Sacramento State, coached Deloso-Flocco during Deloso-Flocco’s three-year career at the L.A. Galaxy Academy that ended after his freshman year in high school. “He’s like my big brother because when I was back with the Galaxy, he took care of me,” Deloso-Flocco said of Nunes. “He called me and told me just, like, congratulations and everything. He always told me to beat his records and I told him that’s cool and all, I would always try to beat his records because of that older-brother thing, but this was my last game and I wanted to put it all in for the boys. Nunes called Palazzotto, his former coach with the Bears, soon after he got off the phone with Deloso-Flocco. Palazzotto got the nod from his peers as MIL Coach of the Year. “(Nunes) told me how far Angelo has come as a player and he told Angelo, ‘I know you didn’t break my record, but you’ve gone farther than me, farther than I have,’ “ Palazzotto said. The Bears’ program grew with Deloso-Flocco, from a 1-2 showing at state his sophomore year after a runner-up MIL finish; to a league championship and semifinal appearance at state as a junior; to the breakthrough championship run that included a convincing 3-1 win over two-time defending champion Punahou in the semifinals. Baldwin–Kupono Coyle; Kamehameha Maui–Parker Awai, Samuel Ostermiller, Gideon Aiwohi; King Kekaulike–Connor Prados, Ty Miller, Jerycho Medeiros; Lahainaluna–Elias Gonzales; Maui High–Jake Madriaga, Ryan Danovich, Cade Mattos, Cole Mattos, Tevita Takitaki; Seabury Hall–Timothy Grupenhoff, Evan Houle, Nathan Chin.